Foggy Bottom West End Villagers were joined on a gorgeous Saturday morning in Historic Foggy Bottom by Villagers from Dupont Circle and Georgetown who had been invited to join us for a tour of Arts in Foggy Bottom’s fourth Outdoor Sculpture Biennial exhibition. 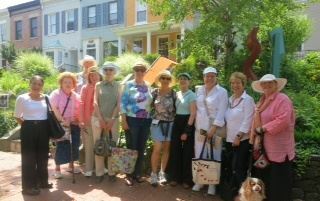 The tour was led by Arts in Foggy Bottom Co-Director Mary Kay Shaw who provided the group with fascinating insights into how the 15 artists responded to the spaces, personae and stories of the Historic Foggy Bottom neighborhood in creating their mainly site-specific pieces. Certainly, many of the Villagers came away with a wholly new impression on the charms and hidden gems of Historic Foggy Bottom along with its art treasures both temporary and permanent. Following the tour, many of the Villagers gathered at Circle Bistro for food and far-ranging conversations including the exchange of information on the operation of our individual Villages.